“ It is said that the present is pregnant with the future." Not surprisingly, after an eight-year run, the bull market finally collided with reality. 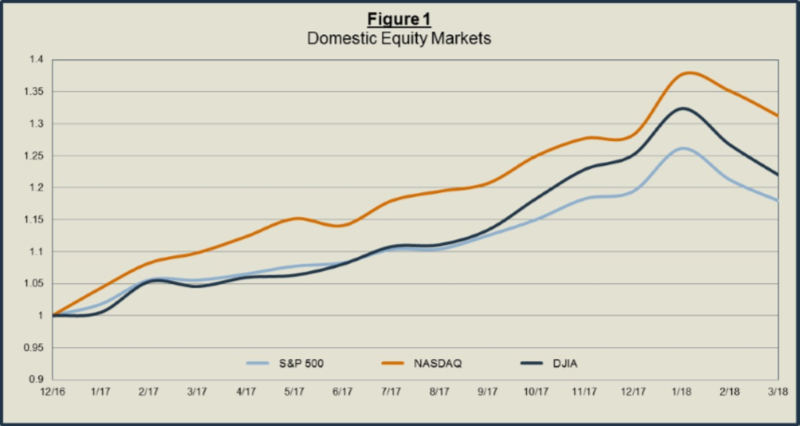 On the heels of nifty gains in January, equity markets closed with a whimper before heading into “correction” territory (S&P -1.2%; DJIA -2.5%; NASDAQ 2.3%).1 So, has the danger passed or is bigger trouble ahead? In our previous writing we discussed a methodology for assessing the stock market's downside risk. 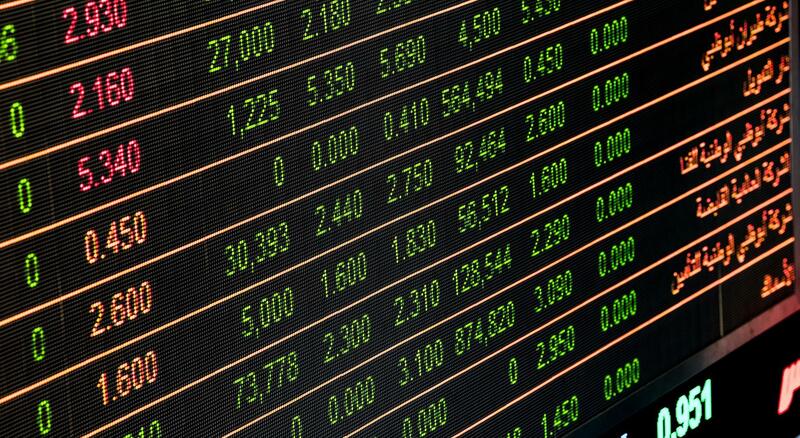 Empirical evidence confirms that the ratio of Gross Domestic Product to the New York Stock Exchange's total capitalization provides a useful measure of intrinsic value. But the price-to-economy ratio (P/Ec) isn't the only tool for detecting top-heavy markets.2 "Inverted yield curves" are a warning sign too. Let's take a closer look. It’s a profound statement. And while any number of extraneous factors influence the price of credit, the chief components boil down to three: creditworthiness (the factor that compensates lenders for assuming loan risk) and a markup for expected inflation and taxes.4 If so, then interest rate movements -- especially major swings -- ought to tell us something about changing market environments. And few events are more radical than inverted yield curves. Simply put, a yield curve depicts the interest rate paid on fixed income obligations (usually Treasury securities) across a range of maturity dates. Normally, the curve is upward sloping (Figure 2, orange line) which makes intuitive sense since investors should receive higher yields for the additional risk of buying longer investments.5 So when the yield on a short term (so-called "riskless") 12-month Treasury Bill exceeds that on a 10-year Treasury Note (Figure 2, blue line), the curve becomes downward sloping (i.e., "inverted"). In effect, an inverted yield curve rewards investors less for taking long-term risk than it does for simply buying a very safe 12 month T-bill. When thinking about Fisher's formula, there's an advantage to using Treasuries. It diminishes the importance of credit worthiness, leaving investors to wrestle only with inflation and tax considerations. And since statutory tax rates change infrequently, expected inflation quickly looms as the bugaboo behind interest rate fluctuations. So what's the implication of an inverted yield curve? Proceed with caution. For starters, the yield curve has an enviable track record for predicting economic downturns. The last seven times it inverted, a recession followed. As always, the timing is tricky to get right as there have been instances of a multi-year lag before economic declines are realized, but the linkage is still there. 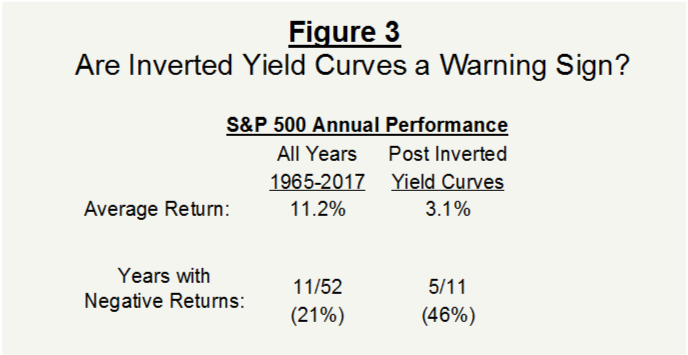 Can we derive anything about future stock market returns from the shape of the yield curve? An annual snapshot reveals that the Treasury yield curve ended the year inverted on 11 occasions since 1965. How did the stock market respond? Not well. Figure 3 shows that 46% of the time, the S&P 500 went negative after an inversion, with an average return over the ensuing 12-months that was anemic by comparison to its historical norm (3.1% vs 11.2%). If exceptional tests prove the rule, consider this. Measured on a daily basis over the last half-century, the S&P has declined more than 20% on 6 occasions. Of these, 5 were preceded by inverted yield curves during the run up to the "bear" market. Importantly, paying attention to the yield curve isn't about timing meltdowns or estimating their magnitude. It's about prudently managing cash allocations. The takeaway from this analysis is straightforward. Whenever the yield curve is “normal,” maintain a cash position consistent with each portfolio's risk/return objectives. But when the spread between short and long rates turns negative, protect assets by shifting a portion of the equity component over to cash equivalents. True, the re-balanced portfolio wouldn’t be immune to turbulence. But the chance of surviving it increases. While today's interest rate structure remains normal (Figure 2), yields are once again on the move and inching higher. But in this arena, the landscape can shift quickly. So mind the curve. 1 As measured by the S&P, share prices increased 5.6% during January before collapsing 6.5% over the balance of the quarter. 2 At year end 2017 the ratio value was nudging the upper limit of fair value. See "Insights," Boston Research and Management (4th Quarter 2017) for details. 3 Irving Fisher, The Rate Of Interest, The MacMillan Company (1907), p. 336. 4 Fisher was first to distinguish between the market (or "nominal") rate of interest and a "real" rate that adjusts for inflation's impact on purchasing power.